Preheat oven to 325 degrees. Grease (generously to prevent sticking) muffin tins or bundt or 10" tube pan. Cream butter and sugar at medium high speed using mixer. Beat eggs in one at a time using low speed. Add sour cream, vanilla, and lemon zest. Incorporate flour and baking soda while mixing at medium low speed until smooth. Try not to overmix. Pour into pans. 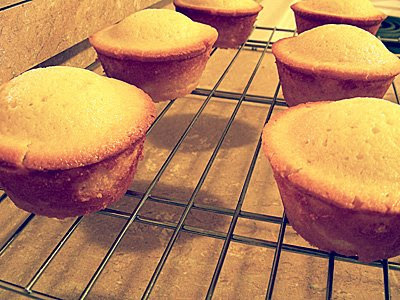 Bake about 30 minutes for cupcakes or until toothpick inserted in middle comes out clean. Cool for about 5 minutes on rack, then loosen from tins and let cool. If using bundt/tube pan bake for about 1 1/4 hours, let sit on rack for about 10 minutes before turning out to cool. Makes 12 servings (520 calories ea. ), I got about 20 cupcakes (about 310 calories each - approximation in calorie count is because I got 18 plus 12 mini cupcakes). I might make a glaze with the remaining lemon juice and some sugar to add next time, but I was pleased with the buttery flavor, light crumb, and texture, though the lemon turned out to be more like a hint of lemon... gee, I'll have to try a few more just to make sure ;D My favorite part (and one of the reasons for using muffin tins) are the crispy bits around the edges of the tops. Yummy!!! oh~!~ i so wish that i felt like i had time to bake something up as this recipe for pound cake looks delicious~! !~ i have very little self control around pound cake . . .
i hope all is well with you and yours. take good care.